The terminology server, which is where your data is stored. Changes to the ontology will be routed through this server. The bugzilla server, which is where your tasks are managed. Changes in the task status and the workflow process that will be routed through this server. Change the setting on your login screen to Remote repository... . 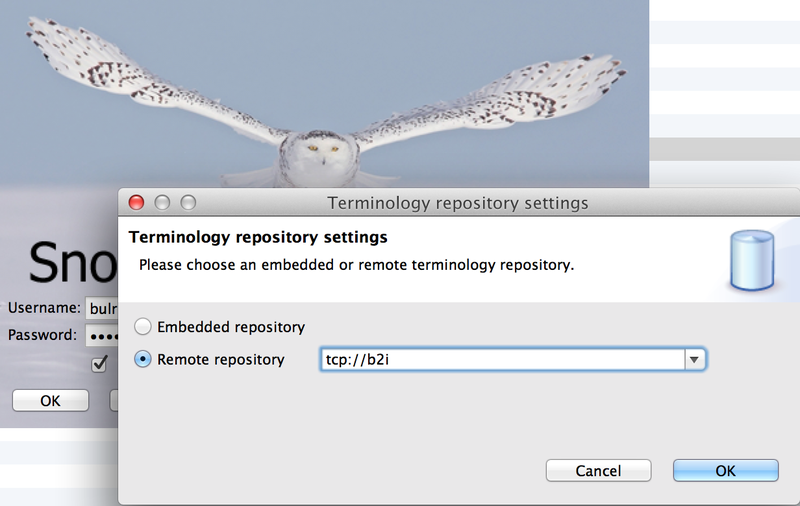 Enter the network address of the remote repository in the text field and click OK. This will connect you to the terminology server. Working with the terminology server is fairly similar to working with a wiki page. You log in, and you can read or edit information, but the information is stored on the wiki page and not on your computer. The Snow Owl terminology server works the same way: Whenever you make changes to the ontology, they will be stored on the server, not on your computer. The data is also on the remote server on not on your computer like in the standalone version. In order to collaborate with other users you need to set up a remote task repository, which is used to create and manage tasks. Go to File > Preferences > Snow Owl > Bugzilla Repository. Enter the URL for your task repository. Click OK. The new repository is will now be added. It is displayed in the Task Repository view. After the new task repository is available, you might need to connect the product names in Snow Owl to the terms used on the Bugzilla. If your default settings use the same names, this is not necessary. 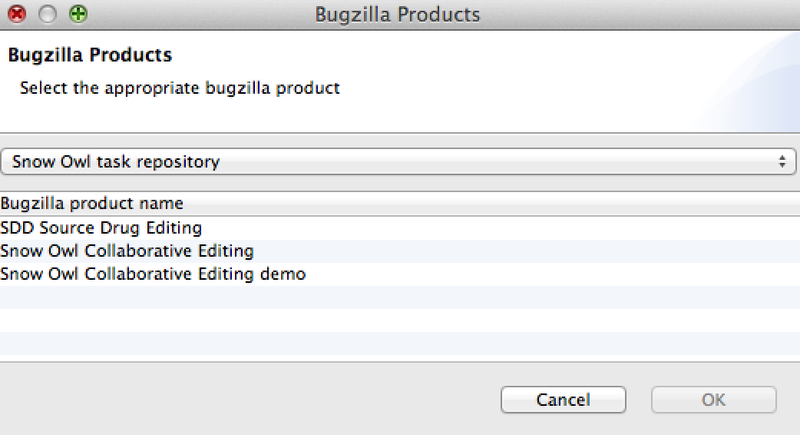 To see which product names are used go to File > Preferences > Bugzilla Repository > Bugzilla Products. 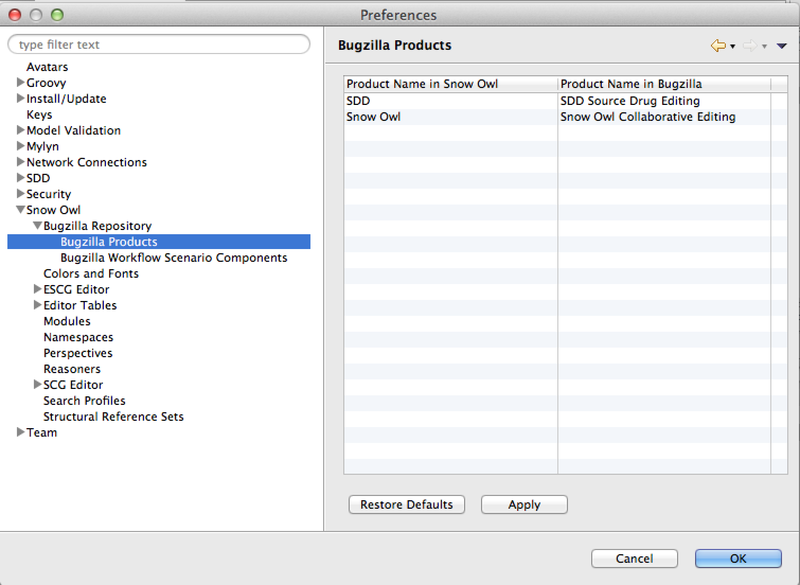 The column on the left side shows the product names used in Snow Owl, the column on the right displays the default product names used in Bugzilla. Click on a product name in Bugzilla - an ellipsis will appear once you click on the cell. 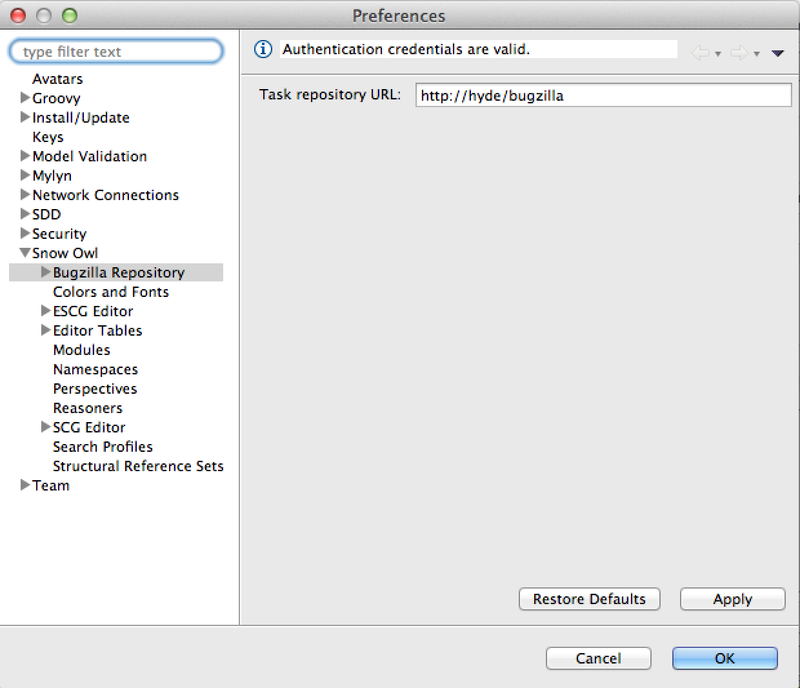 Select your repository from the browsing dialog to load the product names from bugzilla. Select the name that matches the term used in Snow Owl, e.g. SDD Source drug editing (Bugzilla name) matches with SDD (product name used in Snow Owl). Click OK.